SCOTT MILLER added himself to the St Duthus history books this past weekend when he hit the net in the 94th minute against Inverness Athletic, bagging himself a treble. His hat-trick was the first to be recorded by a Saints' player since their revival this year. 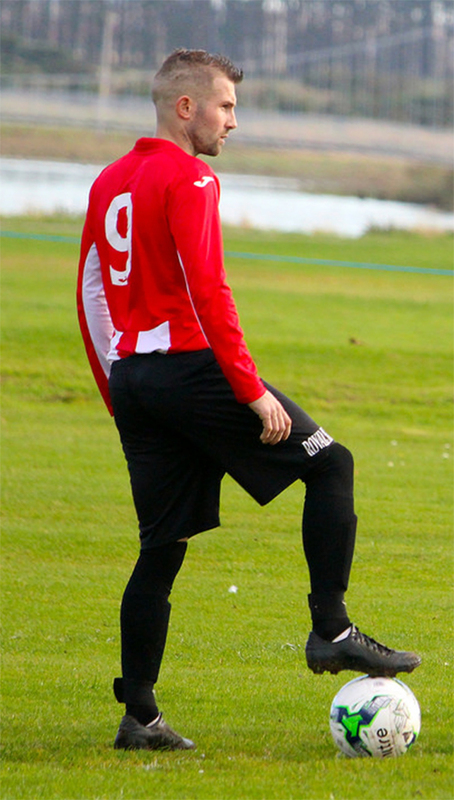 Scott, 26, has proudly represented his home town of Brora for eleven years, playing as a striker with recreational side Brora Wanderers, who currently ply their trade in the North West Sutherland amateur summer league. Along with Paul Cowie, he began the step up to training with the Saints in August and on the 22nd he had his first taste of action when he was played as a forward during a pre-season match against Fort William. He made his first competitive appearance against Shetland in the Football Times Cup the following month at Halkirk's Morrison Park, and after impressing as a substitute during a hard fought 3-3 draw, disaster struck as he missed the deciding penalty that would ultimately send Shetland in to the next round. From there, his path to first team football has been an uneven one. "I felt I had a good start to the season, but I went my first couple of games without scoring and was unable to attend a few training sessions. I was basically at the bottom of the pecking order by that point and I was close to packing it in. Instead, I decided to work harder than I had been and I got back to training, and after being selected for the Orkney game I was able to make an impression. As a confidence player, getting my first goal against Lossiemouth last week was all I needed, and I really knew the hard work had paid off after I'd scored the hat-trick on Saturday." Scott's story so far is indicative of the club's journey throughout their revival season. From day one, it has not been without its challenges. But for the Saints striker, the legacy of securing the first Saints' hat-trick will far outweigh that of his penalty miss - proof enough that hard work and perseverence does pay off. And he isn't alone. Confidence has been running through the veins of the whole team this past week, as Stuart Ross and his St Duthus squad overcame a four match losing streak, having defeated Lossiemouth in the quarter final of the North Caledonian Cup, before opening up a gap at the bottom of the league table with a 3-1 win over Inverness. The squad, which has been plagued with absences throughout the first half of the season, appears as though it is now coming together. Despite his years of experience with the Wanderers, and having represented several sides at North Caledonian level in the past, such as Dornoch, Bonar Bridge and Balintore, Scott is especially delighted to be a part of this confidence-filled group at St Duthus. "I for one am delighted I have joined the Saints and I will be at the club as long as they will have me. From the Chairman, to the managers and the trainers and everyone who helps around the club, you can see the club is full of ambition and is well organised. Everyone gets on really well and there are good players here. I think as a group we have gelled superbly. The manager in particular lets you know exactly what he wants from you, and pushes you to get the best from you. There's no doubt that summer football is good fun, but the higher standard of football in the North Caley allows you to really test your own level and place demands upon yourself."